Scott Overton, President "Our PTA fundraising has received a boost with the easy-to-use ptaFUNDCenter... [More]"Our PTA fundraising has received a boost with the easy-to-use ptaFUNDCenter. Our members shop at online retailers and a share of each sale benefits our PTA…easy to use, smart design and something we can share with our school families and friends with our website and social media accounts." Mr. Kenneth Doolittle - Curriculum Supervisor "As a district, we're always looking for ways to help students with financial difficulties offset the cost... [More]"As a district, we're always looking for ways to help students with financial difficulties offset the cost of concurrent courses and attend leadership conferences. I met with our Superintendent and Community Relations Committee about schoolFUNDCenter, and they were eager to add sponsors to our K-12 websites. Now, we can open doors and provide experiences for our students by simply encouraging their families to shop through our websites." Dr. Cindy Wigley, Superintendent "School Bell's School Website Fundraiser is automatically bringing in additional funds through our school websites and... [More]"School Bell's School Website Fundraiser is automatically bringing in additional funds through our school websites and main district website. The efforts for each school's leaders to promote this fundraiser are minimal and new revenues being generated are significant." 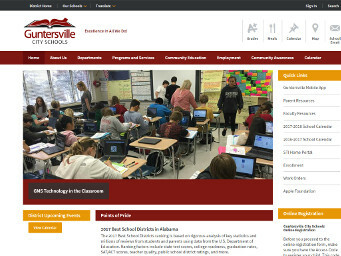 Frederick E. Ayer, Superintendent "I thought School Bell's website fundraiser was too easy to be true, but it took our IT Director an hour to connect... [More]"I thought School Bell's website fundraiser was too easy to be true, but it took our IT Director an hour to connect all of our websites and we've been earning money non-stop ever since! With online shopping rewards added to the fundraiser, our goal is to quadruple our earnings this school year." Mr. Mikulas Vislocky, Computer Tech Specialist "Adding SchoolFUNDCenter to our Wix website was extremely easy. We promoted the program through email and mailers to parents who responded strongly and enabled the school to add much needed funds to the events budget for our students."